Thank you for purchasing our Theme. Please do not forget to rate the Theme and We'll be waiting for your Feedback. It would be nice to see your comments on our product, this documentation consists of several parts and shows you how to set up and administrate your WordPress site. First of all what is WordPress CMS? A WordPress Theme is a skin for a website built with the WordPress CMS platform. 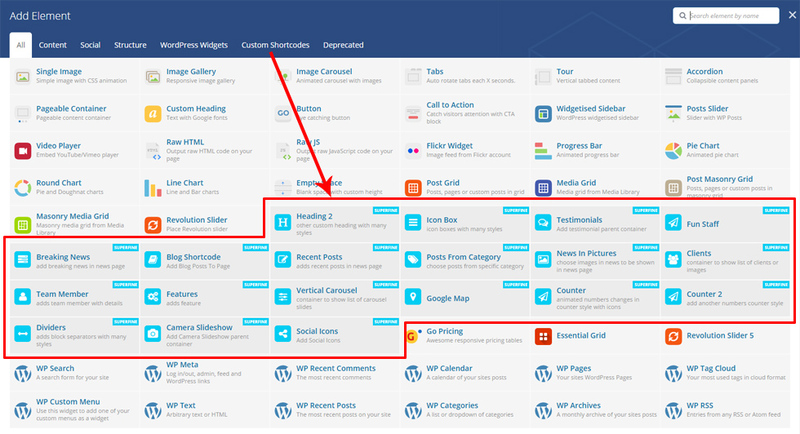 In other words, you can easily change your WordPress Web site appearance by installing a new Theme in a few easy steps. With all its simplicity, a WordPress Theme is provided with all the necessary source files and you are free to edit or extend it the way you need. demo-data: inludes all demo data files such as: revslider folder , go_pricing.txt , essential_grid.json that will be explained below. I'm using 5 Customizable CSS styling files in this theme. The colors.php file contains all of the custom skin colors for the page, if you used a custom skin color in theme options page. assets/css/light.css This file contains all the necessary styling for the light theme. assets/css/light.css This file contains all the necessary styling for the Dark theme. assets/css/assets.css All Assets needed for Animations, Magnific Popup, Counters, Slick Slider, Camera SlideShow, etc... compressed in this file to save performance. assets/css/colors.php contains all of the custom skin colors for the page, if you used a custom skin color in theme options page. assets/js/post-like.min.js This file contains all functions responsible for post likes. Go to the downloaded package then select Theme/superfine.zip and extract it. From the Available Themes section, click on the SuperFine title (or SuperFine screenshot) to activate. To activate the Theme click the Activate SuperFine link in the top right. If you want further notice about SuperFine Theme updates, then please follows us on twitter or constantly visit our support Team. Find the Resources folder inside the root folder of SuperFine Theme. 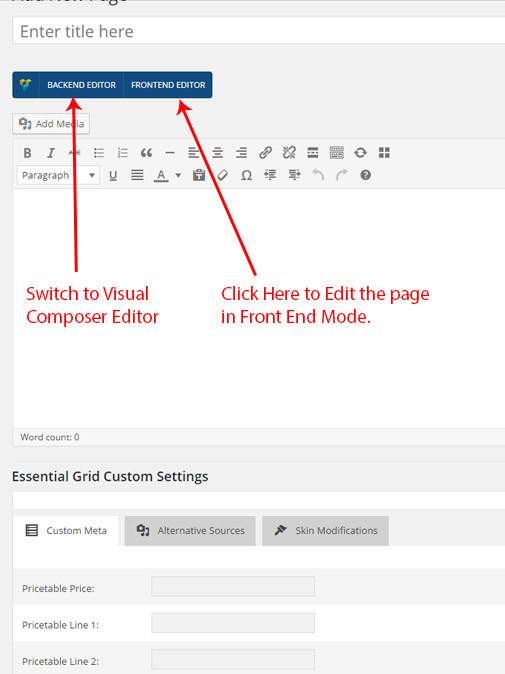 To Import sliders, Essential grid GRIDS and Go Pricing content, just go to these plugins in the left side of the Administration Panel and select import/export link in each plugin then import the corresponding content for each plugin from demo-data folder. Go Pricing Plugin: We included a file (go_pricing.txt) in the demo-data folder that contains demo pricing tables data that is shown in our demo page: Here You can only import it. Soon Template: For coming soon page. Let's discuss each element in our theme. Custom CSS Here You can add Custom CSS Code that will be applied on the front page. Tags Limit Control the Number of tags that will be displayed in tags widgets. Twitter API Config Will be Explained Later in the configurations section. Google Analytics - Tracking Code Copy and paste your google analytics code here and it will be inserted automatically in your page footer. Search Page Settings Choose How you want to show Search results page (Without Side Bar Or Left, Right Side Bar). Contact Details This block contains your address, Phone number and your Email that will be shown in: top bar contact or in footer contact widget. Twitter API Config To change the twitter api to yours, you see 3 inputs: Twitter usename: put yours, Widget ID: you have to register a widget on twitter by going to This Link then after finishing, copy the output and paste it in a new text file, find "data-widget-id" copy it's value and paste it in Widget ID, Tweets Limit: type the number of tweets to be shown in this widget. Authors Page Settings This setting is for the Author's details page that can be found in this link: http://YOUR-DOMAIN/author/USER-NAME/, You can show hide author information, posts by author, and the way to display the author's posts (Large image, Small image, Grid, Masonry and Timeline) and even add text or HTML to be shown before and after All authors' pages. Contact Info: Address, email address will be shown on the left of top bar on left side. Top Bar Menu Links: Displays a menu, to show it, go to Appearance, then menus and select Top bar menu then add menu items to it (this will be shown on left side). Login / Register Links: Displays a login / register links and welcome to guest on left side. Text or HTML: Adds whatever text or HTML code you want that will appear on left side. Empty ( No Content ):Leave left side empty without content. Social Icons: Displays social icons with links to your social media pages on Center side. Contact Info: Address, email address will be shown on the left of top bar on Center side. Top Bar Menu Links: Displays a menu, to show it, go to Appearance, then menus and select Top bar menu then add menu items to it (this will be shown on Center side). Login / Register Links: Displays a login / register links and welcome to guest on Center side. Text or HTML: Adds whatever text or HTML code you want that will appear on Center side. Empty ( No Content ):Leave Center side empty without content. Contact Info: Address, email address will be shown on the left of top bar on right side. Top Bar Menu Links: Displays a menu, to show it, go to Appearance, then menus and select Top bar menu then add menu items to it (this will be shown on right side). Login / Register Links: Displays a login / register links and welcome to guest on right side. Text or HTML: Adds whatever text or HTML code you want that will appear on right side. Empty ( No Content ):Leave right side empty without content. Show Shopping Cart: Select this option to show the shopping cart in the top bar. Cart Position: choose to put the shopping cart on left or right in the top bar. Top Bar background color: Choose your new custom background color from the color picker. Background Image: Select an image from the uploader or insert an image url to use for the top bar background image. 100% Background Image: This option lets you choose if the background will fit the container width and height or not. Top Bar color: Colorizing the text in the top bar. Top Bar Icons color: Colorizing the icons in the top bar. Header Layouts This option enables you to select header style from the 17 available header styles, just click on the image of the header you want and then hit the save changes button. Main Menu Effect: Choose the animation that will show up the sub menu of the Main menu items. Sub Menu Color: Choose from the 3 pre-defined sub menu colors. 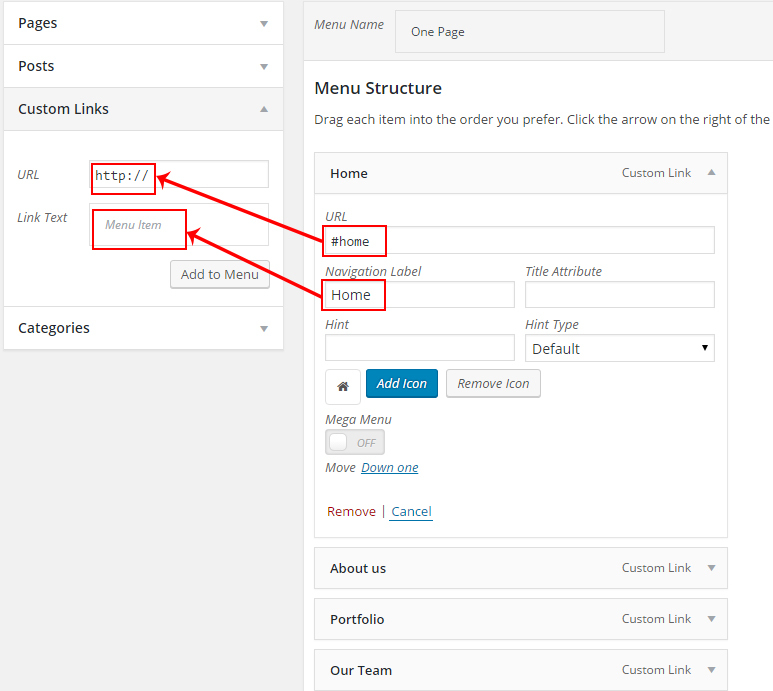 Links color: Choose your new custom color for the menu links from the color picker. Menu Icons color: Choose your new custom color for the menu icons from the color picker. Header Banner Image: This option is only available in bannered header, and lets you upload Ads image to be shown in the top of the page (baside the logo). Header Banner Link: Ads link to be set on the header bannered banner image. Site Title: Choose your new custom background color from the color picker. Logo Font Family: Select an image from the uploader or insert an image url to use for the top bar background image. Logo Font Size: This option lets you choose if the background will fit the container width and height or not. Logo Font Weight: Colorizing the line separators between texts or links in the top bar. Logo image: Colorizing the text in the top bar. Site Slogan: Choose your new custom background color from the color picker. Slogan Font Family: Select an image from the uploader or insert an image url to use for the top bar background image. Slogan Font Size: This option lets you choose if the background will fit the container width and height or not. Slogan Font Weight: Colorizing the line separators between texts or links in the top bar. Background Opacity: Range fron 0 to 1 to the background transparency. Text Color: Choose your new custom color for the sticky header links from the color picker. 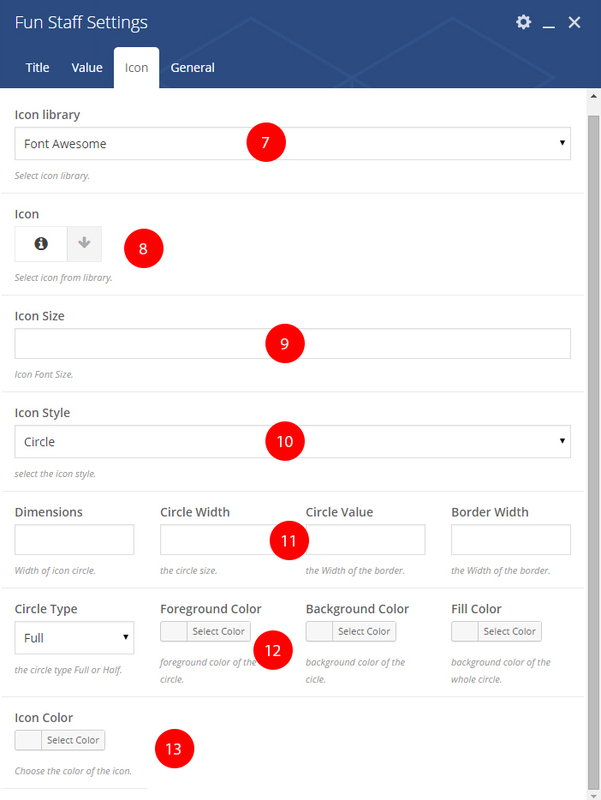 Choose footer style from 9 pre-defined styles. Show Top footer bar above Footer: Show / Hide Top Footer Bar on your site. 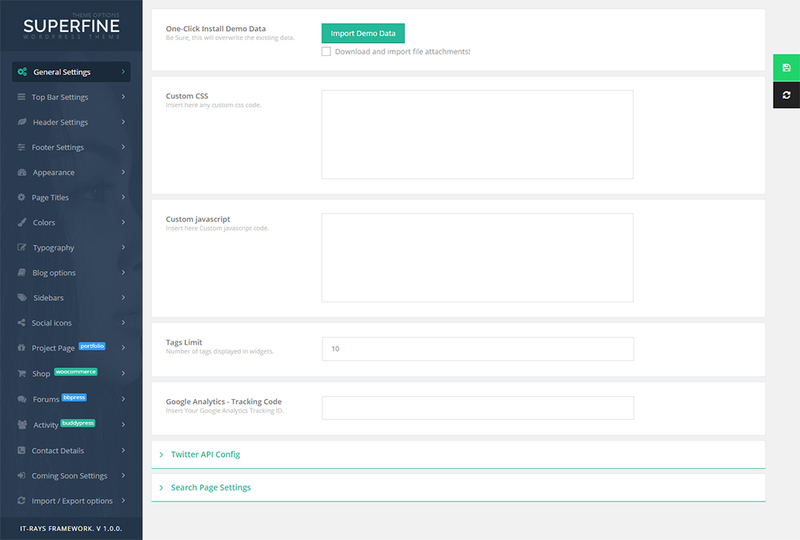 Content: Choose what will be visible on the top footer bar(Latest Tweets , Call To Action , Text Or Text and Social Icons). Left Text: Text That will be shown in the left side of top footer bar in CTA content. 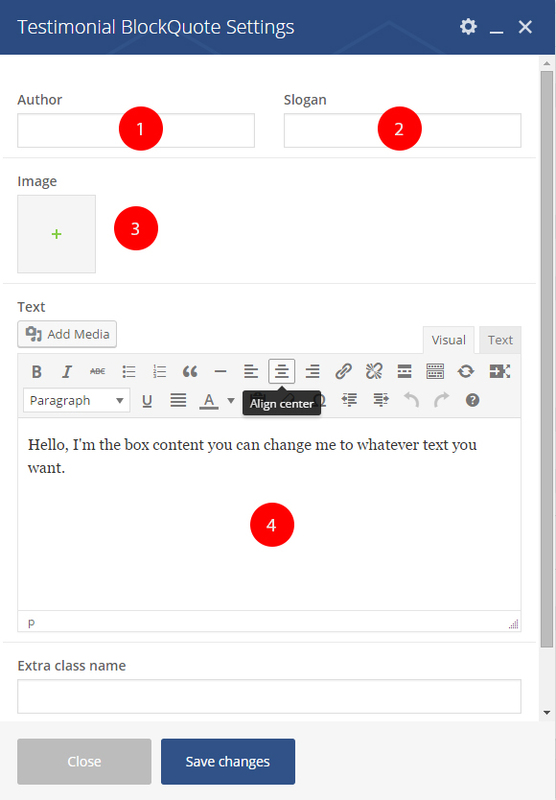 Right Button text: Text That will be shown in the right side button of top footer bar in CTA content. Right Button Link: link of the right side button of top footer bar in CTA content. Footer Widgets: Show / Hide Footer Widgets on your site. Number of Footer Columns: The number of footer widgets columns per row. Show Bottom Footer Bar: Show / Hide Bottom Footer Bar on your site. Enable copyrights: Show / Hide copyrights on your site. 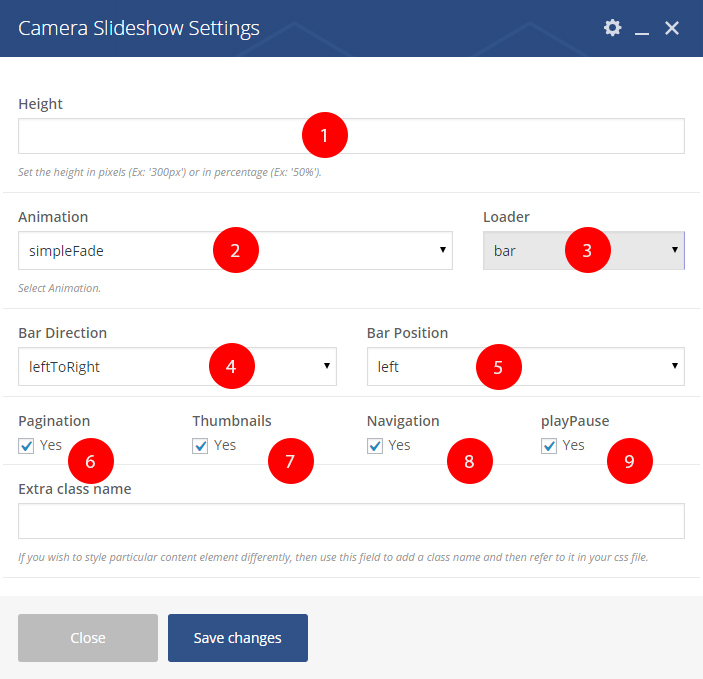 Right Button text: Text That will be shown in the right side button of top footer bar. Copyrights Text: The copyrights text that displays in the bottom footer bar. HTML markup can be used. Display Social Icons on Footer of the Page: Show / Hide footer social icons in the header style 1 only on your site. Show Address in minimal footer 1: Show / Hide Bottom Address in minimal footer. Show Email in minimal footer 1: Show / Hide Bottom Email in minimal footer. Show Phone in minimal footer 1: Show / Hide Bottom Phone in minimal footer. Responsive Layout: if Enabled the responsive design features will be activated. If unselected then the fixed layout is used. Content Width: if not responsive layout type here the main container width in (px) or (%) etc... and this will apply the fixed layout. Favicon This is the Favicon site identity that appears on the top left of the browser's address bar, it is preferred to upload a file with .ico extension with size 16pxx16px. Learn more. Page Transitions Enable / disable Page Transitions. Choose Shape: Choose your prefered shape from 8 available shapes. Upload Background Image: Select an image from the uploader or insert an image url to use for the body background image. Page Title Style: Choose from the available 10 page title styles. Custom Height: type the custom page title height in px or em. Custom Page Title Background? : if enabled the page title will display a custom background image from below. 13 Predefined skin colors choose the one from existing skin files to be applied on all colored elements on your site. Last choice is CUSTOM COLORS: Choose your new custom skin color from the color picker..
Blog Featured Image Size: Select what size you prefere from the pre-defined sizes. Excerpt Length: the text length that appears in the posts list description. Blog Single Featured Image Size: Select what size you prefere from the pre-defined sizes. SuperFine Comes with Unlimited SideBars Feature that enables you to add unlimited numbers of side bars in your wordpress site. SuperFine Comes with Unlimited SOCIAL ICONS Feature that enables you to add unlimited numbers of social icons in your wordpress site. Show Post Content: if enabled the project details page will show the project content. Archive & Tags Style: Choose the way that the projects archive and tags listing page will appear (Grid or List view). Pager Style: Select from 6 available styles the one suits you. Show Side Bar: In the shop pages select to show / hide the forums sidebar. Show Side Bar: In the shop pages select to show / hide the buddypress sidebar. Show Address on top bar info: Show / Hide address on the top bar info. Phone Number: Show / Hide Phone Number on the top bar info. Show Phone on top bar info: Show / Hide Phone on the top bar info. Email Address: Show / Hide Email on the top bar info. Show Email on top bar info: Show / Hide Email on the top bar info. Enable Maintenace Mode: If YES the site will be closed except for admins (Maintainace Mode Enabled). Social icons Hover Background color: Choose a solid color for the coming soon Social icons Hover Background color. 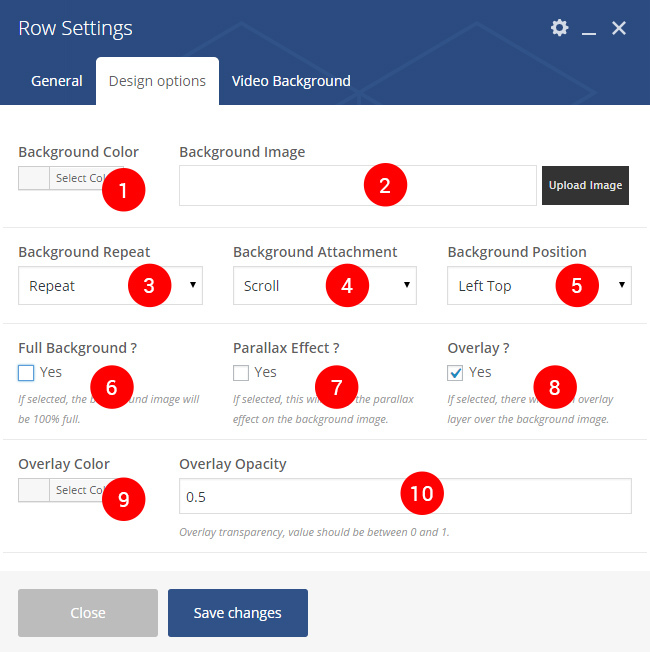 100% Background Image: Check this box to have the top bar background image display at 100% in width and height and scale according to the browser size..
Theme options textarea: Here you will find all current theme options saved in this textarea. Download File: By clicking this button you will save the current theme options as a (.txt) file - you will use it in future if you need to return this backup. Upload a saved .txt file then click on Import file then all new theme options will be applied. 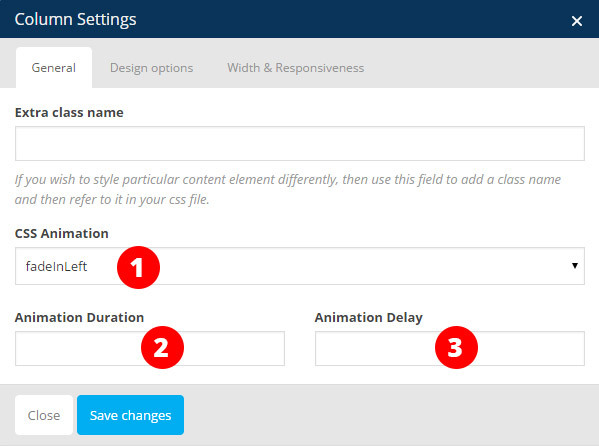 SuperFine comes with 19 custom shortcodes + the default shortcodes from Visual composer. Select the gap between columns. 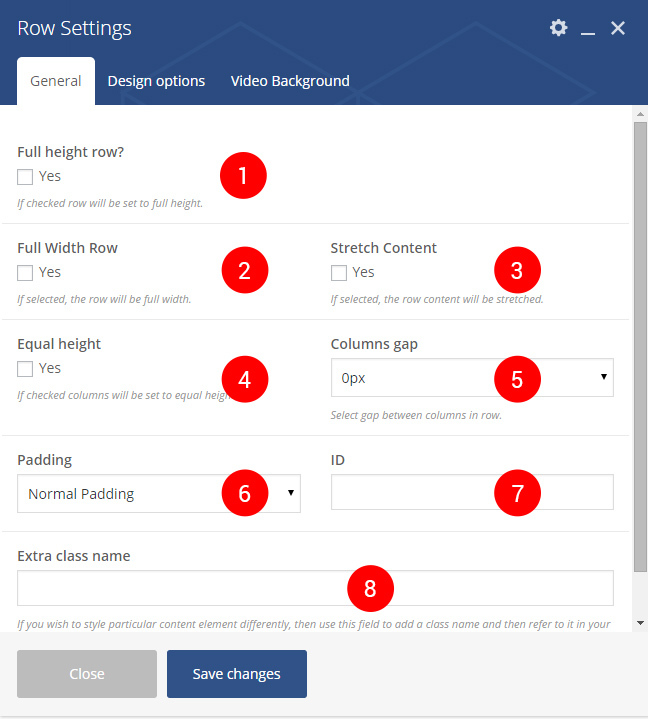 This option lets you choose if the background will fit the container width and height or not. The Overlay transparency level, Value from 0 to 1. 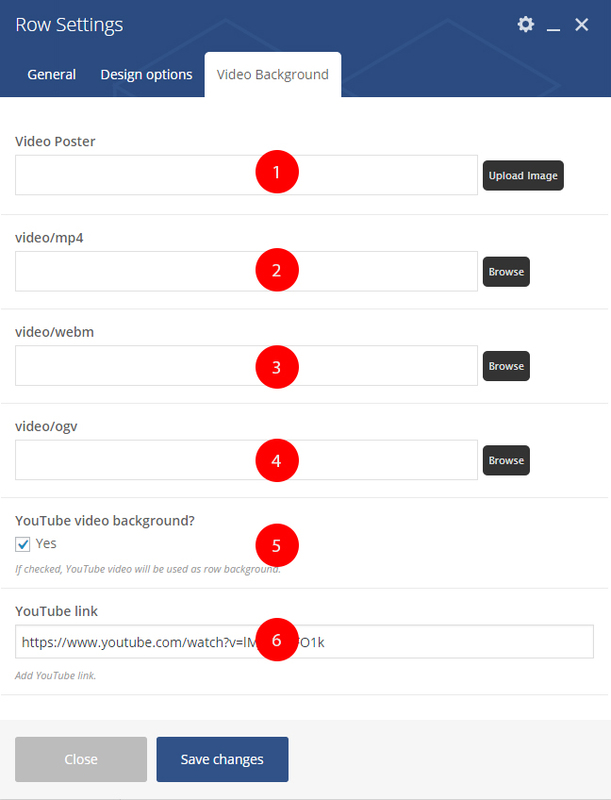 Upload An Image for video poster cover. Video in mp4 format you can upload it or type an external link from other url. Video in webm format you can upload it or type an external link from other url. Video in ogv format you can upload it or type an external link from other url. Enable this option to use a YouTube Video. Type Here the YouTube Video URL. Choose the way to animate this column. Animation Delay in milliseconds till this column appears. Choose Heading Style from 11 predefined styles. Heading Custom Color from color chooser. Heading Font Style, If check the Heading will be in uppercase style (Ex: HEADING). Sub Heading Font Style, If check the Heading will be in uppercase style (Ex: SUB HEADING). Box Style: Select box style from available 10 box styles. Box Title: Enter text for box title. Title Color: Choose a color for box title from color picker. Box Content: Enter description text for box content. Icon Color: Choose a color for box icon from color picker. Icon Background Color: Choose a Background color for box icon from color picker. Icon Text: This Will replace the icon with your new text. Box Link Enter libk for read more box content. Upload or select an existing image for this author. Title for this fun staff item. Fun Staff item Fone Color. Use Icon: If checked a new tab with icons select will be shown and this will Show an icon with your Fun staff element.. Item Value in numbers that will be aniamted. Enabling This option will apply animation on numbers. Type Here Icon font Size (Ex: 20px). Choose Icon Style (Circle Or Shape). Responsibe for the Circle Icon Styling. Also Responsibe for the Circle Icon Styling. Pager Style: Select the pager style from the 7 predefined styles. Style: Select the recent posts style from 5 predefined styles available. Carousel ? : If selected a new tab with Carusel will appear to select the carousel option from. Number of posts: The max. Number of posts that will be retrieved from database and shown in this shortcode. Non Carousel Columns: Select the Number of columns per row in case it is not carousel. Hint This shortcode is specially designed for the news magazine page, but if you need to use it in other page or for other purpose it is Ok. Item Title: Enter the title for this box. Upload or select an existing Client image. 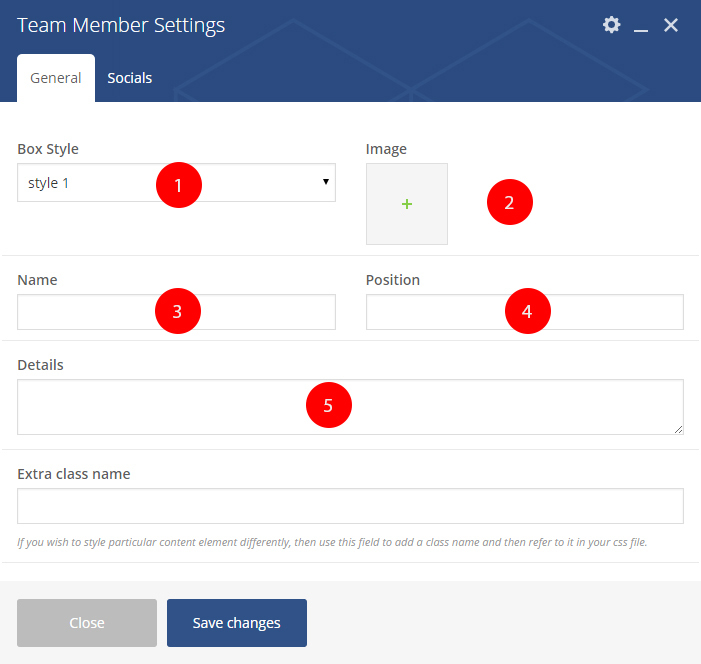 Team Box Style: Select style from 5 predefined styles. Upload or select an existing Member image. 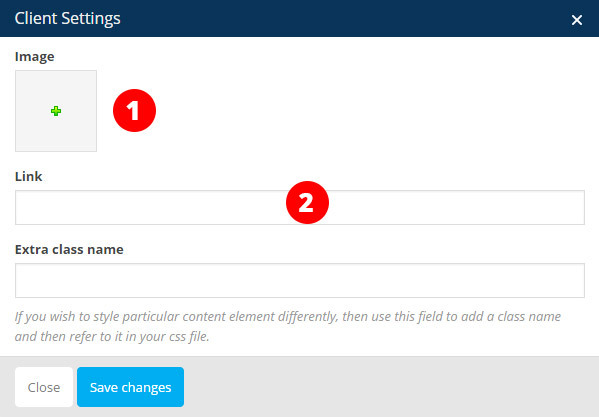 Style: Select the feature style from 3 predefined styles available. 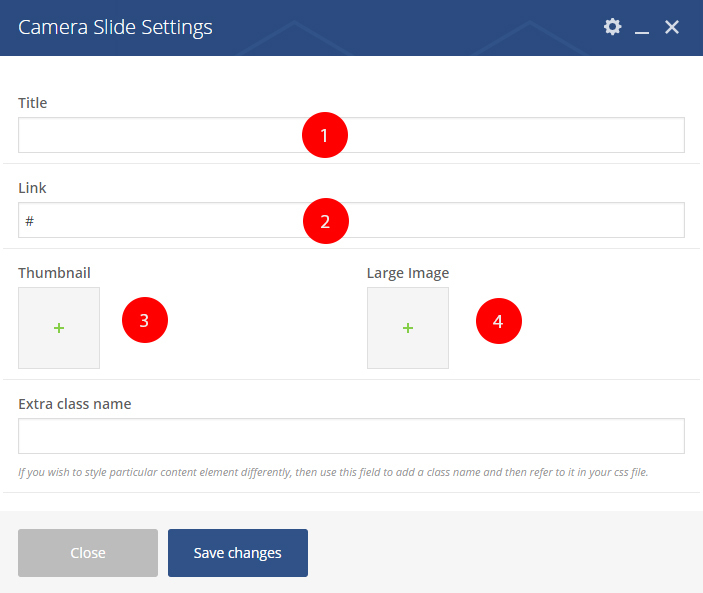 Image: Upload or select an existing Slide image. Headquarter: Type here more details about the location on google map. Item Title: Enter text for item title. Title Size: Type title font size in px or em. Description: Enter item description text. Description Color: Choose description color from color picker. Numbers Color: select numbers color from color chooser. Numbers Size: Type numbers font size in px or em. Icon Size: Type icon size in px or em. Box Shape: Select your prefered box shape from the 9 available shapes. Box Background Color: Choose box background color from color picker. CSS Animation: Select how the box will animate. Text Before: Enter text before the numbers. Text After: Enter text for after the numbers. Text Color: select text color from color chooser. Text Size: Type Text font size in px or em. Height: Set Slider Height in px Ex: 200px. If Preloader is BAR -- This indicates the bar direction animation. If Preloader is BAR -- This indicates the bar position. If Enabled the thumbnails will be shown below the slider. Right and left arrows navigation. Play and Pause buttons for slideshow. Slide Title that will be shown in the black backgrounded caption. This is the slide link. Upload or Select an existing Thumbnail (Prefered to be in 100px wide x 75px height). Upload or Select an existing Large Image for the main slide image. Use Icon ? If checked a new tab with icons select will be shown and this will Show an icon with your Social Icon element. Icon Title: This is the title of the new added icon. Icon Link: Link for the icon. Page Title Settings As Explained in the theme options you can do all above steps in this section, you can hide page title, add custom background image, custom icon, set different page title style from the 10 available, set custom height, custon colors and also set custom video background, and too many other options. Header Settings Show / Hide header and top bar, set different header style. 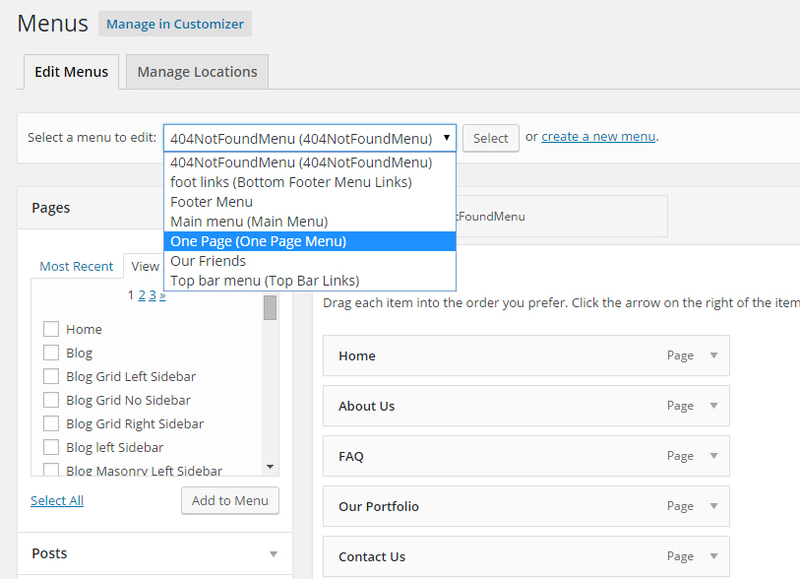 Footer Settings Show / Hide Footer, set different footer style.